For New York Textile Month, Weaving Hand will participate by offering workshops for the duration of the month as well as hosting an interactive wearable dance performance towards the middle of September in lower Manhattan. The performance will be a celebratory experience that includes participants of other NYTM events, in addition to creating a fun and engaging atmosphere for everyone involved. During the course of the month, the company will be offering workshops and studio tours as well. fridman gallery will host a performative series of wearable woven cocoons, Techno-Love Series, an interactive audiovisual exhibit featured in the MAD Museum (madmuseum.org/events/ techno-love-series). They are inspired by the experiences of a recent revelatory experience enjoyed by artist Cynthia Alberto at a desert musical festival. The shape and style of the cocoons are meant to mirror the functions of Sensory Pressure Vests, which are weighted vests that are to be placed onto children or individuals who are overly stimulated to weigh them into place. They will be statically placed, but visitors can take them down and wear them on their bodies. 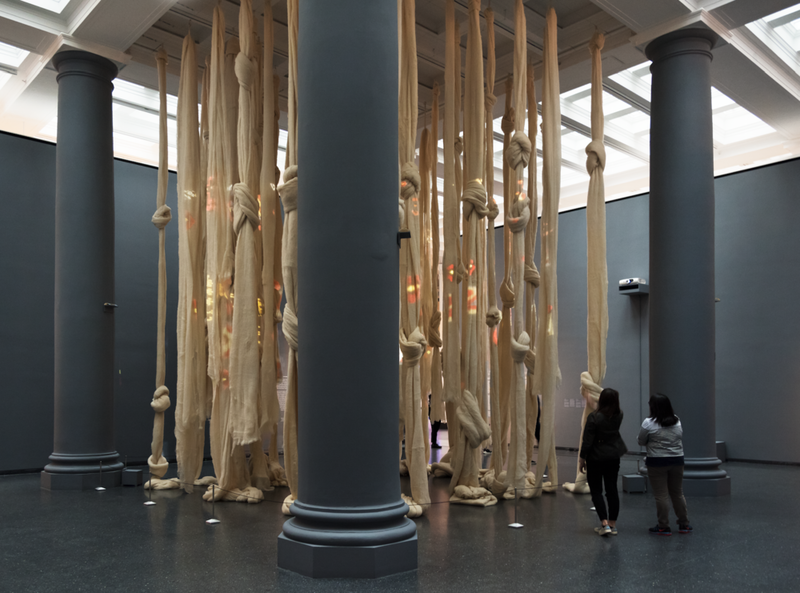 The cocoons are built using traditional weaving methods, and utilize recycled rope from another project - MoMA’s 2016 “Weaving the Courtyard” exhibit. On the evening of September 13th, 2018 at 7PM, there will be a choreographed live performance of the pieces in a 20-minute show with electronic music, and a troupe of dancers. Zakhele Zamisa is a New York-based music producer with a knack for hip-hop, electronic music, and their respective subgenres. He is curating the soundtrack that will serve as the backdrop to Cynthia Alberto’s interactive audiovisual exhibit Techno-Love Series. Steam Stretch is a technique by which creases are woven into A Piece Of Cloth using heat reactive thread which shrinks when steam is applied to the garment. The two techniques combined to form the basis of Steam Stretch are: PLEATS, which was born in the late 1980s as a result of a constant quest for new material and technique development; and A-POC – an acronym for A Piece Of Cloth - is the approach developed in the late 1990s where garments are made by a single-form creation process. Clothes are first made into shapes and then pleated. Using this “stretchable thread,” both vertically and horizontally in the weave, it enables the fabric to be stretched or shrunk in any direction. By the simple application of steam to the cloth, the fabric that was at first flat, instantly transforms to take on a 3D form with countless surfaces, following the contours of the designed creases. In Kookerville, MAD’s Fall 2017 Van Lier Fellow Lexy Ho-Tai presents mixed-media artworks and soft sculptures crafted from found and recycled materials, exploring the intersection between craft and play. As part of the Museum’s Fellow Focus series, the exhibition considers art and accessibility in the context of Kookerville, an imagined world created by Ho-Tai, which will be activated by a culminating participatory performance. In Kookerville, our inner children are manifested in brightly colored creatures called Kookers, constructed with detachable parts such as instruments and masks to encourage public participation. The creatures’ large scale, bright colors, and whimsical demeanor spark spontaneous moments of human connection and social disruption through play and absurdity. Ho-Tai conceived the ongoing project in 2015, as a temporary escape—a world of healing through joy, color, and imagination—and a catalyst for unleashing viewers’ creativity and self-expression. She offers the alternative world as an opportunity for visitors to reevaluate their own world and imagine new possibilities, however unexpected or “kooky” they may be. On view in the sixth-floor Project Space, Kookerville is the fourth installation of the MAD Education Department’s Fellow Focus series. Dedicated to highlighting the work of alumni of the Van Lier Fellowship, part of MAD’s Artist Studios program, Fellow Focus invites these emerging artists to showcase the artwork they produced while in residence at the Museum. Funds for the Van Lier Fellowship are provided by the New York Community Trust Van Lier Fellowship Program, which supports talented, culturally diverse, economically challenged young people who are seriously dedicated to careers in the arts. Lexy Ho-Tai is an interdisciplinary artist working primarily with found and recycled materials using traditional craft techniques. As a teaching artist, she emphasizes collaboration, engagement, and participatory projects as integral to her practice. Interested in the intersection between art making and social change, she explores themes of human connectivity and female empowerment as well as narratives of the inner child to produce work that is humorous, playful, and interactive. Ho-Tai earned a BFA in Fashion Design from Parsons School of Design and also studied textiles at Central Saint Martins, London. Kookerville is organized by Cathleen Lewis, Vice President of Education and Programs, and Marissa Passi, Coordinator of Public Programs, for the MAD Education Department. As part of Design Agency ANTIANTI studio's VIDEOVIDEO Series, Shawna Wu is presenting a live fashion installation and artist video, featuring handcrafted textiles and natural dyeing with Asian ingredients. 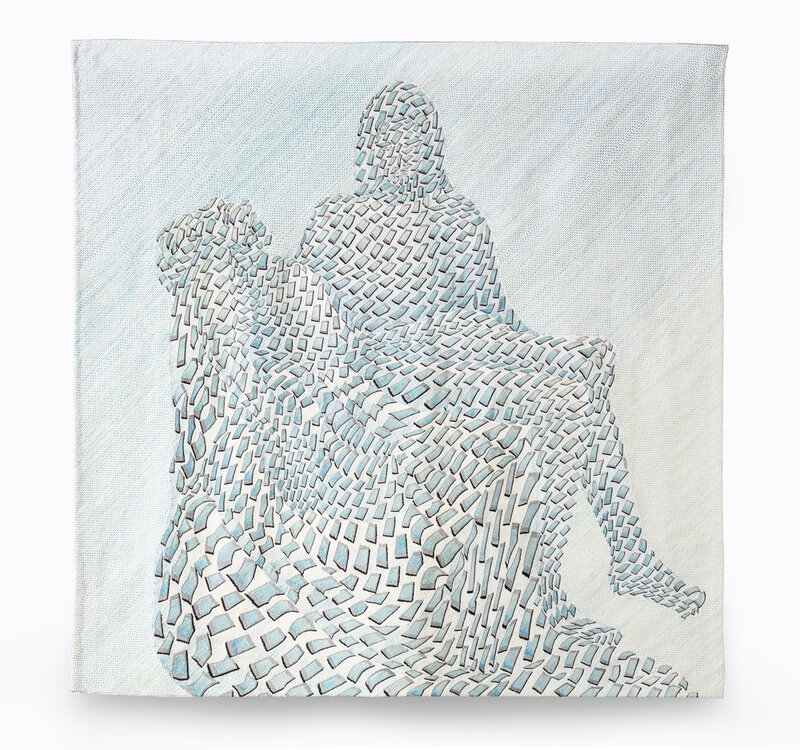 Shawna Wu (b. Singapore) is a New York based Taiwanese artist who works sensuously with garments and textiles. "A dressing is for a wound..." - Her work explores the ways in which materials address our understandings of (and gaps in) intimacy, empathy and cultural nuance. Much of her practice draws influence from her Eastern-Western cultural hybridity to find ways to learn and innovate from ancient, alternative sources of knowledge and culture. In a similar vein, she is interested in sustainable practices in fashion and textiles, and her works are labors of love elevated through handweaving and handknit craftsmanship, reiterating the idea of a deliberate, thoughtful material consciousness. Soul RnB singer SLODOWN will also be cohosting with a live performance and dropping the debut of his latest music video! Stop by to learn and share with one another! See you there! In an age when all is virtual, and appearance glorified, Moroso goes back to routes of tradition and handcraft with M’Afrique. Started as a social project in Dakar, Africa, in 2009, the handwoven outdoor pieces designed by international talents have become integral part of the brand’s collections. 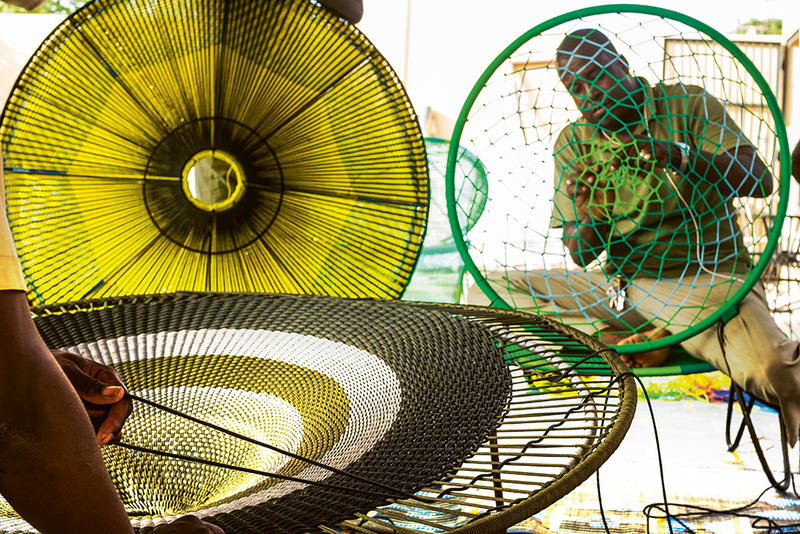 Inspired by local nature and colors, each piece can be replicated but carries the unique of the handcraft process by using traditional fishing cords to weave patterns and structures. The Moroso showroom will display it’s M’Afrique creations in the flagship showroom located at 146 Greene Street, New York. This stunning textile represents a successful integration of the handweaver’s sensibility with the power and versatility of electronic jacquard technology. It was created by Patricia Kinsella in 1991 when she was a member of the Muller Zell Jacquard Project, an opportunity for invited weavers to explore and develop work in an industrial setting with the support of the Muller Zell textile company in Germany. The weaving presents a dramatic composition activated by columnar shapes with jagged contours, that establish an interesting interplay of figure and ground. The relatively flat dark shadowy forms, containing subtle shifts of dark blue hue in a weft dominant twill, contrast with the bright warmth of the summery sunset colors of the patterned ground. Some of the horizontal stripes, anchor the composition with a tactile and visual solidity echoing architectural divisions/appointments like window panes, while other stripes blend softly with one another in an atmospheric glow. By contrast, the vertical stripes of the warp appear fragmented as they define the surface of the randomly placed diagonally oriented organic figures that resemble gestural brush strokes. The squiggly raised lines that appear in these directional shapes of warp dominant satin, are determined by a dominant weft weave structure that adds an interesting textural detail and quality of connection with the ground plane. The warp stripes appear in faint echoes throughout the entire field in a beautiful example of optical color blending. While the color is clearly the main player in the composition, the selection of weave structures beautifully emphasizes the physicality of the plane. The relief surface provides a haptic enticement to the graphic appeal of the design. Satins produce a slightly raised reflective surface, while the twills enliven the ground and the columns with directional movement, exhibiting the regularly spaced diagonal repetition that is a foil to the various angles, and curvilinear edges which define the shapes. The horizontal and vertical stripes, visually weave in and out of space and provide a macrocosmic reiteration of the microcosmic grid of the warp and weft axes. 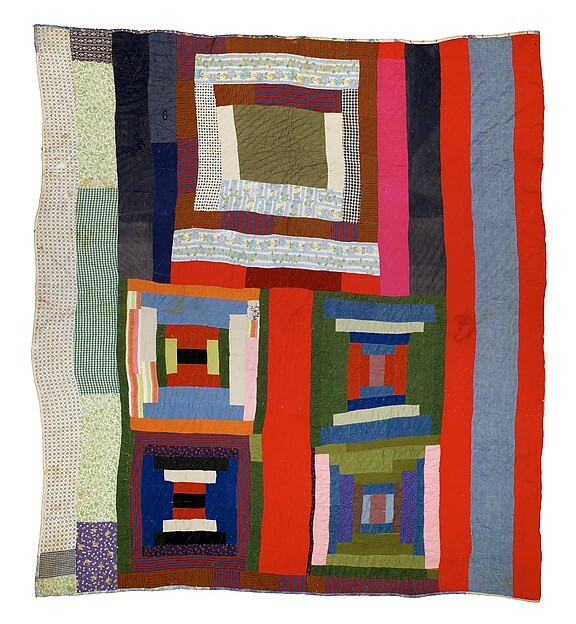 Kinsella had previously been immersed in the creation of unique complex hand weavings that contained a similar vocabulary of marks, patterns, colors and textures. They were rich in spatial and associative intrigue, referencing maps and fractals while emphasizing the axes of weaving through selective gradations of color in both the warp and weft. The color play juxtaposed smooth and abrupt relationships throughout the field causing the ground shapes or patterns to recede and advance in unexpected passages throughout the composition. 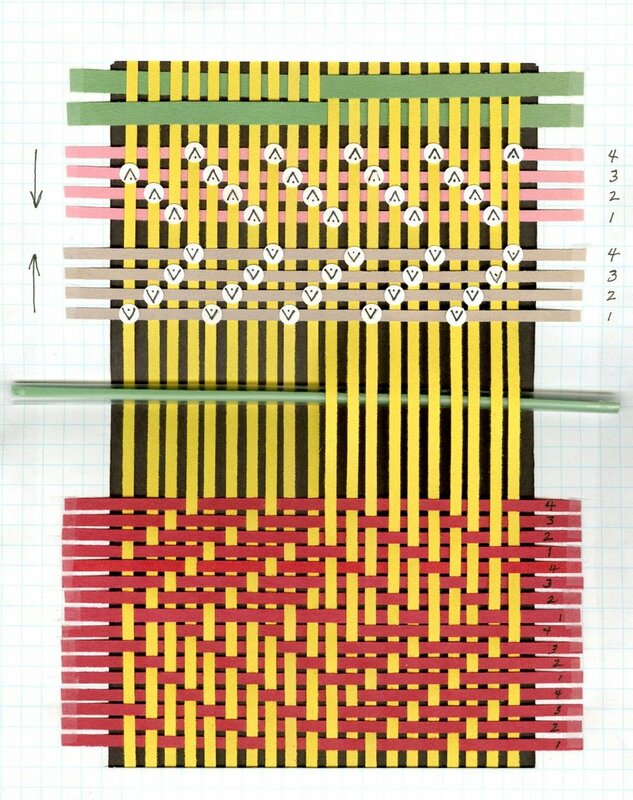 When invited to participate in the Muller Zell project that allowed her to create this weaving in the Cooper Hewitt collection, she had to switch gears and recalled the challenge of the experience to me in our recent email conversation. Because her hand woven pieces were all singular conceptual objects, she wanted this jacquard textile to retain some of that unique character by avoiding a strongly defined repeat. She was able to create a design with a very large repeat that it is difficult to discern at first glance. Primarily she was interested in maintaining the “palpable physicality of color” that characterized her handwoven work. To this end, she did some sampling on her hand loom with yarns of her own choosing to explore color, texture and structural/weave options. She then had Muller Zell wind a special warp for her weavings that contained multiple warp stripes arranged to her specifications. In the weft, she used the maximum rotation of colors capable of being handled by the electronic loom – even having yarns plied specially for her to obtain the blending of color that was essential to her design. Kinsella was pleased with the results and I too find them beautiful and effective! Janice Lessman-Moss is a weaver and professor of textiles in the School of Art at Kent State University. Textile scholar Milton Sonday is one of the world's foremost authorities on the structures of handmade fabrics, particularly woven textiles and lace. Hired in 1962 by the Textile Museum in Washington, D.C., as a draftsman for a project on Precolumbian ceramics, he was promoted shortly thereafter to assistant curator responsible for carpets. In 1967, he joined the curatorial staff of the Cooper Hewitt Museum. Early in his career, Sonday began to put his artistic skills to use in creating legible and visually pleasing technical drawings that express the weaves of patterned textiles. 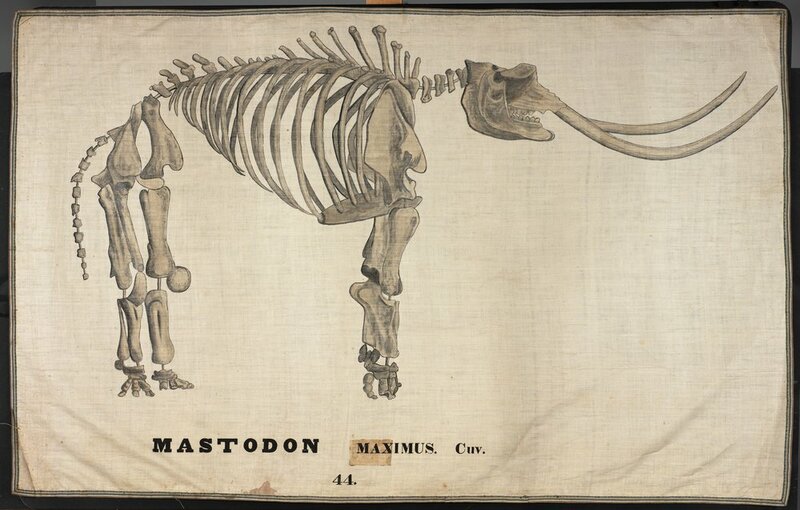 He went on to teach seminars on fabric analysis, developing various methods that enabled students (even those who claimed they "couldn't draw") to re-create and therefore understand the structures of historical textiles. This installation includes a selection of Sonday's studies of lace structures and couched embroidery, loom models for patterned weaves, and diagrams made from classic handwoven textiles. His clear, comprehensible, and attractive drawings and models have become more than didactic tools. The wit and imagination evident in Sonday's choices of materials and colors and the skill with which the works are made has inspired delight and appreciation over the years. Los Angeles–based artist and designer Tanya Aguiñiga has established herself as a crucial voice working at the intersection of fiber art, design, social practice, and activism. Her work, ranging from her “Performance Crafting” series—which uses craft to generate dialogues about identity, culture, and gender—to furniture whose material and form reimagine its functionality to provide “support,” shows a commitment to design thinking as political. At the heart of her practice is an inquiry into how community is created, and the role that craft, design, and materiality play in its formation. Founded by Aguiñiga and launched in 2015, AMBOS (Art Made Between Opposite Sides) is a long-term initiative that activates sites along the US–Mexico border through collaborative art-making and storytelling projects. Started as a month-long activation at the San Ysidro border crossing in Tijuana, it has evolved its focus to record and paint a picture of life along the length of the border. To date, AMBOS, in collaboration with artists and community organizations working with border issues/themes, has produced programs along the border between the United States and Mexico, stopping at thirteen US/Mexico ports of entry, and crossing a total of forty times. Tanya Aguiñiga: Craft & Care will be on view in the second-floor gallery. Photographer Tony Vaccaro (born in 1922) has captured a broad range of our world during his almost 80-year career. He is best known for his photos taken in Europe in the 1940s. Later, he became a renowned fashion and lifestyle photographer. Tony Vaccaro has photographed kings and queens, presidents and popes, writers and actors, artists and scientists. In 1964, LIFE magazine sent him to Finland - to Marimekko. 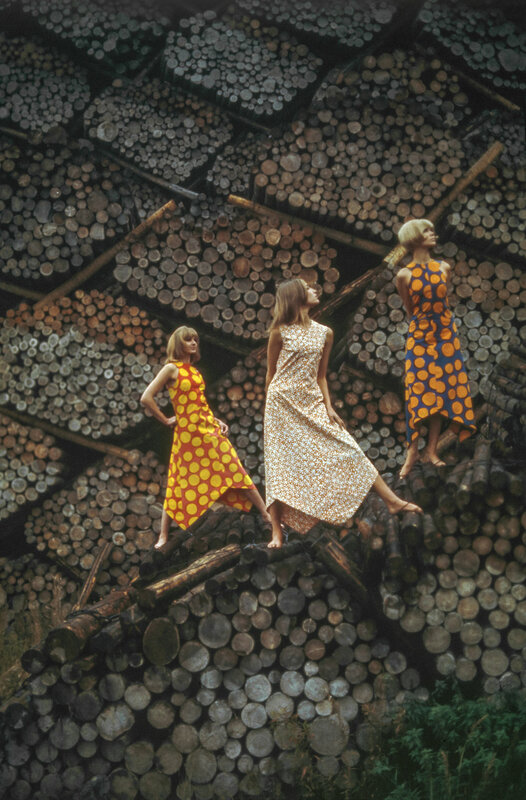 This photoshoot gave us one of the most iconic sets of Marimekko photography, which today acts as an enchanting visit to the joyous and colourful 1960s, the origin of Marimekko. One of the models, Anja, was to become Tony Vaccaro's wife. What a story! Please join at our flagship store to view in person. This spectacular, permanent exhibition of some 700 works of Native art from throughout North, Central, and South America demonstrates the breadth of the museum's renowned collection and highlights the historic importance of many of these iconic objects, including dozens of textile works.